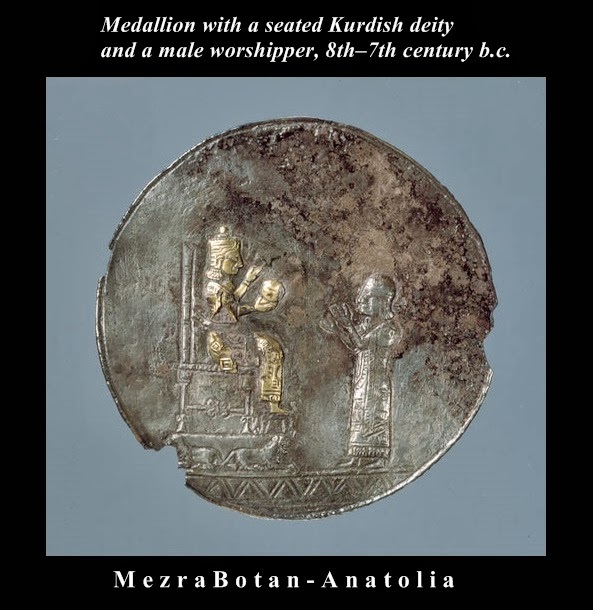 Medallion with a seated Kurdish deity and a male worshipper, 8th–7th century b.c. According to the 1911 Encyclopaedia Britannica, Gordyene is the ancient name of the region of Botan (now Şırnak Province). It is mentioned as Beth Qardu in Syriac sources and is described as a small vassal state Zagros Mountains in the mountainous area south of Lake Van in Nortnern Kurdistan Corduene must also be sought on the left bank of the Tigris. It has been cited as the country of the Carduchians, a fertile mountainous district, rich in pasturage. The three principalities of Corduene, Moxoene, and Zabdicene are referred to as Carduchian dynasties by Toumanoff. The Kingdom of Gordyene emerged from the declining Seleucid Empire and for most of its history, it was a province of the Roman Empire and acknowledged the sovereignty of Rome. From 189 to 90 BC it enjoyed a period of independence. The people of Gorduene were known to have worshipped the Hurrian sky God Teshub.